They want the government to change company law. 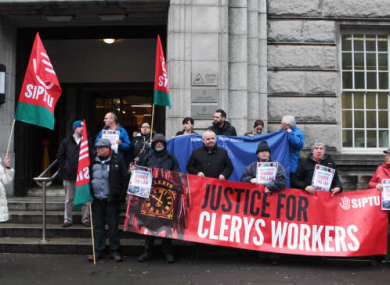 IN THE SIX months since Clerys was closed suddenly, staff have fought for and won their entitlements, but for a group of former workers, that’s not enough. The group, backed by Siptu, want the government to change company law that would force firms to talk to staff before shutting down. The “Clerys clause” would enable watchdogs to ban directors who fail to give staff a mandatory 30-day consultation from holding directorships in other companies. The store closed suddenly in June resulting in more than 400 people losing their jobs. Siptu’s Robert Purfield says the staff are no longer fighting for themselves, they’re battling for others. Speaking to TheJournal.ie at a protest outside the Department of Jobs this week, he said that the clause would ensure no other workers face the sudden closure of a business. We’re nearly six months and the workers have gotten all of their entitlements, but there’s been a lot of these issues like in Lagan Brick, so the workers want this clause. “These people accept that what’s gone is gone, but what we need to see is that it doesn’t happen again. Purfield says the organisers have been told that the Department of Jobs is awaiting a number of reports into the issue. Email “Clerys staff want the store's closure to leave behind a legacy”. Feedback on “Clerys staff want the store's closure to leave behind a legacy”.